Custom-engineered, turn-key systems that remove all oils and contaminants from heavy equipment wash water so it can be re-used or discharged to sewer. Oil filtration and recycling systems that will reduce operating costs and protect the integrity of your equipment and the environment. 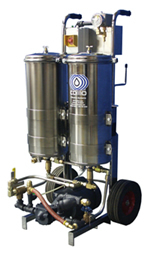 Wash racks, heavy-duty pressure washing and pumping systems for a range of industrial cleaning applications. Heavy-duty, high-quality aqueous-based parts washing systems for many different industrial washing applications.